We’re always a bunch of clashy ragamuffins when we go out in our handknits! We wear them when we can here in NC. I LOVE the brown-ish BSJ. Gorgeous, love all the colors. Beautiful, woman. I love the buttons you chose. 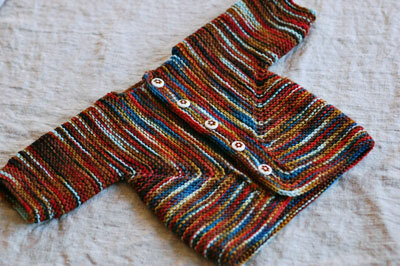 I love the sweater and the buttons are perfect! Very nice. 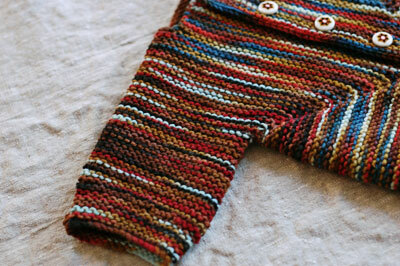 I’m such a fan of nonbaby colors in baby clothes! Well done, and the buttons are perfect! Such a great colorway for that BSJ! I too like non-baby colors! Beautiful BSJ. 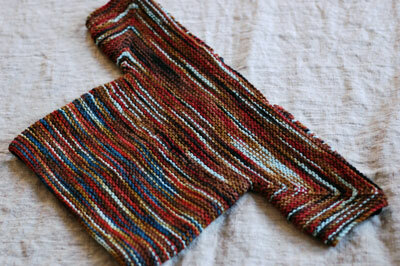 I can’t believe the snow today – I have to say that I am very excited to wear my handknits. What? Handknits can’t possible clash. The charm of the BSJ just never fades and your colors are wonderful. Ummmm. And thanks for including your thoughts on the yarn characteristics. That’s a beauty! I really need to jump on the bandwagon with the BSJ. Sadly though it’s 77 degrees here today so no handknits. Sigh. It’s so beautiful!! I looove those colors. Wow. Hey. I just finished your mini felted skull tote pattern. It was fun. You can see it on my blog. Thanks a bunch. My sister will love it for a Christmas gift! I can’t decide whether this is Wee and Cute, or the colors Rich and Beautiful. 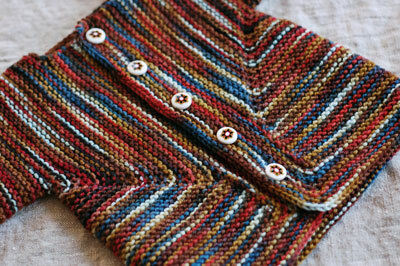 Both ways, it’s a gorgeous little BSJ, I love the buttons you picked! What a cute little bsj – the buttons are adorable! The sweater is way cool and I LOVE the color.